High Peaks Pure Earth has translated a blogpost by Woeser written on June 11, 2013 for the Tibetan service of Radio Free Asia and published on her blog on July 13, 2013. This longer piece was broadcast in two parts in Tibetan by Radio Free Asia, the first part on June 19, 2013, and the second part on June 21, 2013. The blogpost is quite a dense, historical piece about Lhasa and also a commentary on the Tibetan relationship with outsiders. Observing the huge changes taking place around her in Lhasa, Woeser takes a close look at the history and fate of the Tromsikhang, a building complex dating back to the early 18th century. Taken in early May 2013. The name of this place is Tromsikhang but it was being turned into the “former site of the Yamen for the Qing Government Minister stationed in Tibet”. Taken on June 29, 2013. The “former site of the Yamen for the Qing Government Minister stationed in Tibet”, used for the revision of history, was already completed. Very thought-provoking was that two days later, on July 1, on the birthday of the Chinese Communist Party, the new building was officially opened. Does this mean that the CCP is a reincarnation of these Manchurian Ministers sent by the Qing government? 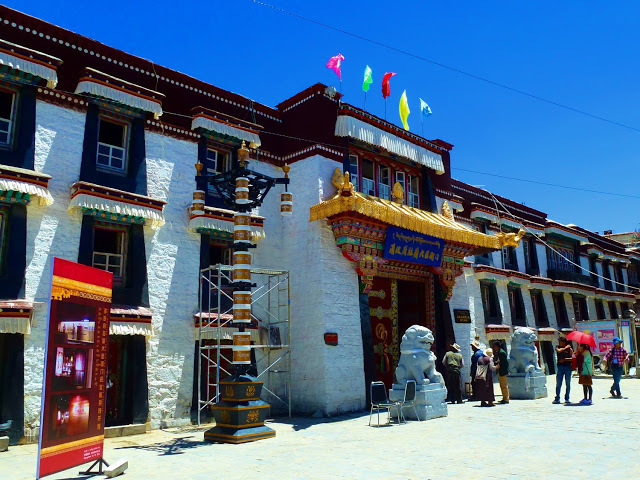 The famous Tromsikhang is situated on the northern side of the Barkhor, diagonally across from the famous Nangzhi Shar (the original Lhasa city hall of the Tibetan government); it was built approximately at the end of the 17th or early 18th century, during the time of the 6th Dalai Lama. It is a Podrang (Palace) in the centre of Lhasa in which the 6th Dalai Lama resided for some time. Therefore “It combines a temple and a noble courtyard house: it is symmetrical along a central axis and is separated by different ranks from top to bottom (the top floor has a large balcony and its interior is beautifully decorated)”. On the roof, we find a purple-red wall of flowers “which indicates that the building was intended to be the city residence of a Dalai Lama.” Back then it was called Phuntsok Rabten Paljor. In the past, the leader of the Qoshot Mongols who used to control Lhasa, Lhazang Khan, also lived there. The building has a very complicated history and is associated with many important historical events. In the history of Tibet, outside intervention fostering other nationalities to enter Tibet is related to a great variety of complicated reasons. For example, during the time of the 5th, 6th and 7th Dalai Lamas, or perhaps as early as during the celebrations of the Dalai Lama’s reincarnation, Mongolians (e.g. Qoshot and Dzungar troops) and Manchurians entered Tibet one after the other; in fact, during that time, “Tibet could never separate itself from the treacherous regency and perilous government.” During the time of the 6th and 7th Dalai Lamas, Tibet was in a chaotic state, the Manchurian Qing Emperor Yungcheng seized this opportunity to establish the first so-called Tibetan Minister; this was in 1727. What needs to be clarified is that the wording of “Tibetan Minister” is only found in Chinese historical data. In Tibetan documents this position is referred to as “Amban” (安班, ཨམ་བན་). “Amban” is a translation from Manchurian language and means “Da Ren” (大人= Great Man), those “Amban” were representatives of the Emperor, sent out to be stationed in Mongolia, Qinghai, Tibet, Xinjiang and other places. They were also known as “Stationed Ministers”, the Grand Ministers Superintendant and his assistant. Those were normally Manchurians or Mongolians and occasionally Chinese, although the latter would usually only be assistants. During the second half of the Qing Dynasty, many Amban in Tibet “were demoted because of incidents within the Imperial Government”. Among the people of Tibet, however, the following saying circulated: “Amban” is the Tibetan pronunciation of the English word “Ambassador”, it is not Minister, it is an Ambassador. This was a misunderstanding, yet it was widespread. This reflects the contradictory Tibetan collective consciousness with regards to the encounter with outsiders. Whether Ambassador or Minister, they were all considered representatives of the Manchurian Qing Emperor who was believed to be too far-away to exercise any influence. Khangchennas, who had driven out the Mongolian Dzungar troops and thus enjoyed great power and prestige within Tibet, took over the chief government seat at Ganden Phodrang and made Phuntsok Rabten Paljor his official residence. When two Amban were on the remote road travelling towards Lhasa, Khangchennas was murdered inside the Jokhang Temple by three other Tibetan government officials who were struggling for power. His two wives were murdered inside Phuntsok Rabten Paljor. Shortly after, another ambitious government official, Pholhanas, captured those three murderers and worked together with the two Amban, using accompanying the Dalai Lama as an excuse to enter Lhasa. He took the opportunity to take some soldiers and ordinary people into the city and in front of Potala Palace, in the Buddhist garden, the three murderers were sentenced to capital punishment, the common form of punishment during the Qing Dynasty, dying the death of a thousand cuts. The people of Lhasa had never before seen capital punishment, they were extremely shocked and mentally disturbed by this. Pholhanas, who took power and became the regent, repented for this the rest of his life and prayed and offered gold lamps for the deceased inside the Jokhang Temple. Even though the Amban only rarely used such cruel ways of punishment that were not indigenous to Tibet, from that day onwards the Chinese government have been using this as “proof” of the cruelty of old Tibet to constantly “expose and criticise” Tibet. Thus the Tibetan historian Shakabpa Wangchuk Tseten comments about Pholhanas in his edited book “Tibet – A Political History”: “For the sake of safeguarding his own power, he worked too closely with the Chinese and thus created the emergence of those Amban and the Chinese troops who pretended to enter Tibet to protect the (7th) Dalai Lama, resulting in a whole series of great political mistakes, also distorting the original reasons for Sino-Tibetan relationships, and eventually creating the basis for today’s hatred and fighting between Chinese and Tibetans, preventing Tibet from becoming a quiet piece of land again” (the book was first published in Tibetan in 1976 and later translated into Chinese by a Chinese Tibetologist; it has been categorised as criticised internal material, the piece quoted here is a translation from that internal material). The official mansion of the murdered Khangchennas – Phuntsok Rabten Paljor – was then renamed by Pholhanas into “Tromsikhang”, making it the first official residence for Ambans stationed in Lhasa; in Chinese history books it is referred to as “Tong Si Gang” (通司冈), which means “being able to see the houses of the city” or also “facing the street”. In 1750, because Pholhanas’ son, Dalai Batur Gyumey Namgyal, who continued to hold power as a regent, requested the Qing government to withdraw the troublemaking Amban and military troops, two Manchurian Amban – Fuqing and Labdon – planned to insidiously murder Gyumey Namgyal inside Tromsikhang. This evoked Tibetan people’s anger, they came and attacked Tromsikhang. The Amban Fuqing killed himself, Labdon was killed together with hundreds of Chinese business people and so Tromsikhang turned into a field of blood and death. However, Tibetan and Chinese history recount this event in completely divergent ways. The latter calls the insidious attempt of murder by the two Amban “the rule of law”; In “Tibet: A Political History”, on the other hand, Gyumey Namgyal “is a courageous national hero who sacrificed his life for Tibetan Buddhism and politics”. This is so because during his four years in office, “he managed to expel most of the Chinese officials and soldiers that had entered Tibet due to the erroneous policies of his father, and the officials sent by the Manchurian government were not allowed to intervene in any internal or external Tibetan government affairs. Not only this, he even tried everything to send any newly stationed Qing people back within a short period of time and advocated for the establishment of a local army.” So the Tibetan regent Gyumey Namgyal who was murdered on his doorstep during the bloodshed at Tromsikhang was not the kind of “dregs” or “traitor” that he is always portrayed as in Chinese historical records. This violent death of the two Ambans had the effect that succeeding Amban did not dare to be aggressive and arrogant. The next Amban who came to Lhasa built a small Buddhist hall at the south side of Tromsikhang in memory of the Amban who committed suicide and the one who was murdered, naming it “Temple of Double Loyalty” and “Worshipping Portrait”. The succeeding Amban also held “Mid-Autumn Sacrifices”. All the following Ambans moved into the living quarters “Samdup Kangsar”, perhaps because they did not dare to continue living in the still blood-reeking Tromsikhang. The residence left behind by the murdered former regent Gyumey Namgyal may have stood as a symbol of the hatred of the Snowland. This image was taken from the book “The Architectural Heritage of Lhasa”, this tablet is called the “Tablet of Double Loyalty”. 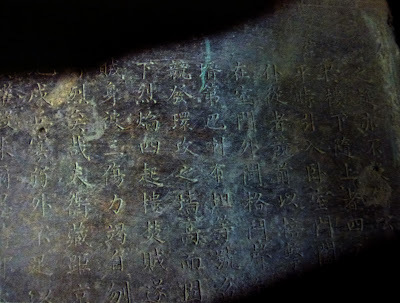 In 1792, Fu K’ang-an was appointed to fight against the Nepalese Gurkha army that had invaded Tibet, he won the battle and subsequently wrote six stone tablets in memory of his uncle – Fuqing, the Amban who murdered regent Gyumey Namgyal – and embedded them in different places in the lower parts of the eastern and western stone walls of the entrance corridor of Tromsikhang. Those tablets tell us in Manchurian, Mandarin, Mongolian and Tibetan that Fuqing executed the regent Gyumey Namgyal “by law” and that the Amban had “carried out an important task” and “sacrificed himself for justice”. Until 1997 when Tromsikhang was demolished, five of these tablets still existed. Afterwards, they were removed and kept inside Lhasa City Museum. According to some resources, three tablets are in Mandarin, two in Manchurian, some of the handwritten words were legible, others were not; nothing is mentioned about Tibetan or Mongolian writing. Today, these five tablets are being used for the purposes of “patriotic education” by local authorities. This shows the Amban’s Yamen that has been in use the longest. It is situated on today’s Duosenge Road No. 1, used as the second guest house of the Tibet Military Area. With Fu K’ang-an entering Tibet, Ambans moved from “Samdup Khangsar” to “Flowery Park” at the south-western side of the Jokhang Temple, which was a lingka (garden) of the Tibetan aristocracy. This is where they erected a Yamen with a pair of lions at the entrance, causing Tibetan people to call it “Duo Senge”, the Tibetan word for lion, which is quite a common name and does not carry any revering meaning as it is commonly propagated today. In 1959 it was turned into a military camp of the Tibet Military area established by the CCP. In the 1980s it was changed into the second guest house of the Tibet Military Area. Since over a period of 185 years, about 138 Ambans assumed official positions in Tibet, there are still a few remains in Lhasa today; it is said that one such remainder can be found in the courtyard of today’s TAR government building; one could call this “using the past to serve the present” and it really can be seen as a continuation of the Manchurian legacy; another remainder can be found behind today’s Tibetan language theatre, which back then was probably just a place of wilderness. Some Amban also lived in the Qing Dynasty Army Camp near Drapchi Monastery, this is probably the place of today’s Drapchi prison where political prisoners are being locked up. Only 6 or 7 Amban actually lived inside Tromsikhang, so what was the building used for afterwards? Originally, Tromsikhang only had one courtyard; because it had three gates, one spoke of the eastern courtyard “Gyegu Shar”, the central courtyard “Gyegu Kyi”, and the western courtyard “Gyegu Nub”. The eastern and western courtyards were connected, the central courtyard’s entrance was the biggest. It is said that later, whenever officials from Bhutan, a subordinate of Tibet, came to Lhasa to pay respect and give presents they would live in the western courtyard. The eastern courtyard was used as the post office, so Tromsikhang was also called “Dra Khang”, meaning post office. On the first floor many Nepali or Nepalese descendants opened small shops. 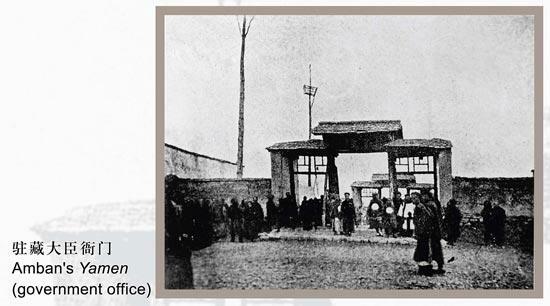 In 1911, after the Xinhai Revolution, Lhasa experienced the “expelling the Chinese incident”, and Tromsikhang was turned into a Lhasa police camp, but at the same time, many ordinary people were using it as housing. After the 1960s, it became a location for residents and residents’ cooperatives. Up to late 2012, before the “renovation” of Lhasa’s old town was launched, almost 100 families were living inside Tromsikhang, over 40 families were living in the western courtyard alone. 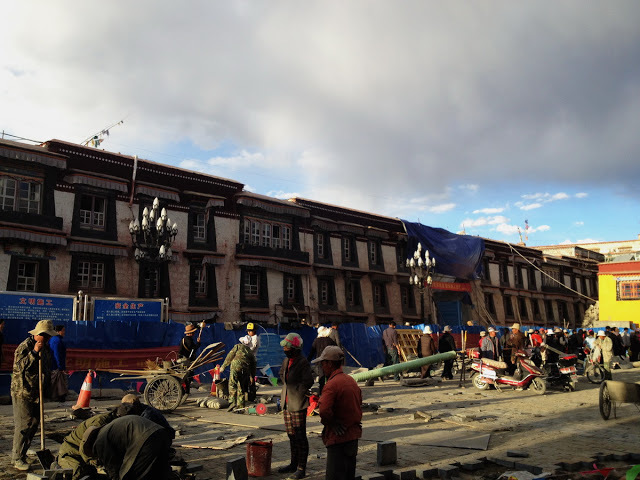 The reason why I investigated and am relaying so much about Tromsikhang is to be able to know and understand the intentions behind the “renovation” of Tromsikhang that is part of “Lhasa’s Old Town Renovation Project”. Originally published at http://highpeakspureearth.com/2013/the-disappearance-of-tromsikhangs-different-lives-by-woeser/ and reprinted in TPR with permission.